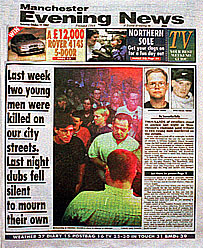 Manchester's bars and night clubs fell silent at midnight on Friday in memory of Simon Speakman and Steven Hughes (see Manchester Evening News front page below), who were murdered by thugs in the city centre last week. The streets were as busy as ever on Friday evening, and a police presence was noticeable, though not overwhelming. 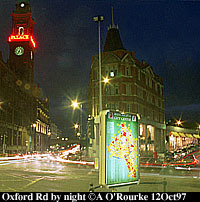 Closed circuit tv cameras normally used for traffic monitoring were transferred to street surveillance, with all pictures being relayed to the Central Police Station near Albert Square. The city centre has no less than 425 pubs and clubs, and attracts thousands of people from both near and far, nearly all of whom, I'm glad to say, have a great time and return home with nothing more serious than ringing ears and a hangover. Eyewitness in Manchester reader Vini Maguire, resident in Sydney Australia (e-mail vini@mpx.com.au), was seen again on the screens of the north west during a feature on BBC 1's Northwest Tonight (There he is (right) looking at Eyewitness in Manchester on his laptop. Note also the new BBC logo in the top right of the screen). Unfortunately, your favourite website wasn't mentioned, but pictures used in the July 24th tv coverage, when Vini was interviewed by BBC Asia correspondent, Michael Peschard, were used again. According to Wednesday's report, local electricity company Norweb is working on technology to allow Internet data flow to be sent via the electricity mains, removing the need for separate cables. The problem up till recently has been interference from the current, but Norweb say they have found a way of solving this. The Manchester-based telecommunications company Nynex continues to lay cables in more and more areas of Manchester, and hopes to have the conurbation completely "wired up" by the end of next year. 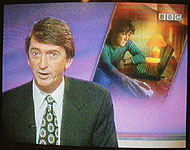 You can send an e-mail message to Northwest Tonight, nwt@bbc.co.uk, and let them know you expatriate Mancunians are "out there", and looking forward to seeing their local magazine programme, which is presented by Gordon Burns (above). Manchester's second Marathon took place yesterday. The 26 mile route went from Heaton Park in the north, through east Manchester and on to Wythenshawe Park in the south. There was major traffic disruption, as thousands of participants, some of them in wheelchairs, struggled along the route. Bashir Hussain, from Stockport, came first - he completed the run in two hours and nineteen minutes. The last runner in the "All Ages Men" category was number 1164, Mr John Ford, from Herne Hill, who took 6 hrs 37 minutes and eight seconds. The fastest female competitor was Sarah Jane Heatley, from Sheffield - two hours 53 minutes and 5 seconds, and the winning wheelchair contestant was David Holding, who took one hour 43 minutes and 33 seconds to cover the route. After last week's Metrolink accident involving a tram and a bus, safety features, including anti-skid road surfacing, have been added to the Corporation Street level crossing, which is controlled by traffic lights. Another set of traffic lights, the ones that survived the 1996 IRA bombing of the city centre, have gone on show at the Museum of Science and Industry. And today a number of children from the Rhodes area were brought into North Manchester General Hospital for check-ups after a mercury spillage was discovered. No-one has so far been found to be suffering from mercury poisoning. Whatever about the dangers of chemicals in the environment, the driver of the bus I took this afternoon sounded like he might have been on something, though I'm certain it was nothing more toxic than a jovial Mancunian sense of humour. "'ang on, we're off," he said, as he drove the red and white single decker, belonging to Bullocks, down Oxford Road. "Only one previous owner, this bus", he informed the amused passengers, "nought to sixty in about four weeks". "Are we there yet?" he asked his captive audience, some of whom were squeezed onto the unusually wide seats at the rear. "Don't forget you can get three people onto the seats at the back on the left, so you can really get to know each other!". The humour didn't let up as more and more students crowded on. "Is it 'alf past nine yet?" he said, feeling the strain. Pulling up at the next stop, he shouted: "I'll take the first three thin ones!". When it was time for me to get off, I pushed my way up to the front, and as I was hopping off, he said "See yer now!" and continued the comedy show on four wheels. It's nice to know busmens' sense of humour I knew from my childhood has survived amalgamation of 119974, privatisation of 1986 and the current monopolisation of the bus routes by Stagecoach, on whose buses you'll never find entertainment like this! That's why I always take the independent operators! The weather this week has been changeable as always, with some heavy rain in the middle of the week. Saturday was cold and overcast, but Sunday was sunny, bright and windy. Today was a cool, crisp sunny October day, with temperatures in the high fifties fahrenheit, 14 or 15 degrees celsius.